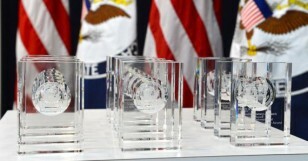 On March 29, U.S. Secretary of State John Kerry presented the 2016 Secretary of State’s International Women of Courage Award to a group of extraordinary women from around the world at the U.S. Department of State. Fourteen women received the honor, which annually recognizes women around the globe who have demonstrated exceptional courage and leadership in advocating for peace, justice, human rights, gender equality and women’s empowerment, often at great personal risk. In remarks at the ceremony, Secretary Kerry underscored the importance of empowering women and girls to make their own choices. The Secretary described the desire of those who push for justice and fight for human rights — like this year’s honorees — as the impetus for historic movements, epic change, and progress that transforms dreams into reality. While recognizing many barriers remain, Secretary Kerry took a moment to acknowledge the enormous progress that has been made toward people coming together and breaking down barriers over the last years. “This breaking down of barriers has not happened by accident. It’s happened because leading governments, including that of the United States, have made justice for women and girls a core part of our foreign policy. Even more, it is because individual voices around the globe have come together to form a mighty chorus in support of positive change,” he said. To mark the milestone of honoring nearly 100 women from 60 countries over 10 years, the State Department hosted a forum following the ceremony. Vice President Joe Biden delivered keynote remarks at the forum and congratulated this year’s awardees. Since the inception of this award in 2007, the Department of State has honored nearly 100 women from 60 different countries. On April 1, the honorees will travel to cities across the United States to engage with the American people through an International Visitor Leadership Program. They will visit Missouri, Kentucky, Alabama, California, North Carolina, Michigan, Minnesota, and Pennsylvania on their individual programs. The women will reconvene in Los Angeles to reflect on their visit and discuss ways to work together to improve the lives of women and girls around the world.